Dr. Derman has been helping couples in the greater Princeton and Trenton areas of New Jersey grow their families for more than two decades. He is also the leader of the team that established the first and only IVF laboratory in Mercer County, and is the only reproductive medicine specialist with admitting privileges at University Medical Center at Princeton. Dr. Derman helps couples who are having trouble conceiving, as well as those experiencing the pain of recurrent first trimester miscarriages. Dr. Derman has been recognized by Castle-Connolly as a regional top doctor in his subspecialty, and is listed as one of Inside Jersey Magazine’s top doctors in Reproductive Endocrinology. Delaware Valley is one very few private OB/GYN practices nationwide to have a fellowship-trained board-certified fertility specialist as part of our group. He also treats women suffering from reproductive hormone disorders, such as polycystic ovarian syndrome (PCOS), endometriosis, amenorrhea, premature ovarian failure and congenital abnormalities of the reproductive system. Dr. Derman sees patients in our Lawrenceville NJ office, and provides services from counseling to basic treatments (fertility drugs, IUI) to more advanced therapies (IVF, ICSI, PGD, CSS) and surgical procedures when needed. As a member of the staff of the department of Obstetrics and Gynecology at the University Medical Center at Princeton, he has been a frequent contributor to the Health Matters column at the Princeton Packet. He has contributed commentary on topics including infertility, recurrent miscarriage, IVF, polycystic ovarian syndrome (PCOS) and endometriosis. 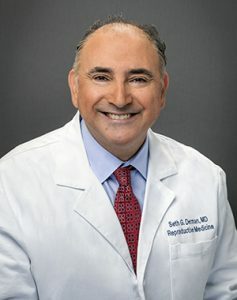 He is a published author on various topics in reproductive medicine and gynecology, and has been featured locally and nationally in print and television news media. In his spare time, he enjoys travel, photography and the outdoors. Derman SG, Rehnstrom JA, Neuwirth RS. The long-term effectiveness of hysteroscopic treatment of menorrhagia and leiomyomas. Obstet Gynecol 77(4):791-4. 1991. Derman SG, Kol S, Ben-Shlomo I, Adashi EY and Payne DW. Transforming growth factor-beta-1 is an inhibitor of interleukin-1 actions in the rat ovary. J Endocrinol 160(3):415-23. 1999. Derman SG, McClamrock HD and Adashi EY. “The Laparoscopically-Assisted AbdominalTubal Reanastamosis (LAATR): A Hybrid Procedure”. Poster presentation at the Conjoint Annual Meeting of the American Fertility Society and the Canadian Fertility and Andrology Society, Montreal, Quebec, October 1993. Derman SG, Adashi EY and McClamrock HD. “Failure to Achieve Pregnancy by Superovulation with Intrauterine Insemination (IUI) and the Prognosis for Success with More Advanced Assisted Reproductive Technologies (ART)”. Oral Presentation at the VIIIth World Congress on In Vitro Fertilization and Alternate Assisted Reproduction. Kyoto, Japan, September 1993. Derman SG, Adashi EY and McClamrock HD. “Failure to Down-Regulate in Response to Leuprolide Acetate (LA) in Patients with Hyperprolactinemia Preparing for Assisted Reproductive Technologies”. Oral Presentation at the VIIIth World Congress on In Vitro Fertilization and Alternate Assisted Reproduction, Kyoto, Japan, September 1993. Derman SG, Kol S, Ben-Shlomo I, Adashi EY and Payne DW. “Transforming growth factor- β1: an inhibitor of interleukin-1β in the rat ovary.” Poster presentation at the 77th annual meeting of the Endocrine Society, Washington, DC, June 1995. Ahmed H, Russell H, Bocca S, Ahmed S, Derman S. “Endometrial biopsy prior to IVF stimulation improves embryo implantation rates.” Poster presentation at the 71st annual meeting of the American Society for Reproductive Medicine, Baltimore, MD, October 2015.